Tables of 10. Ticket includes a glass of Prosecco on arrival and Afternoon Tea with a selection of cakes, cream scones and sandwiches. Please note: booking for this event is by phone only at QUAD on 01332 290606. Booking deadline is Friday 24 May. 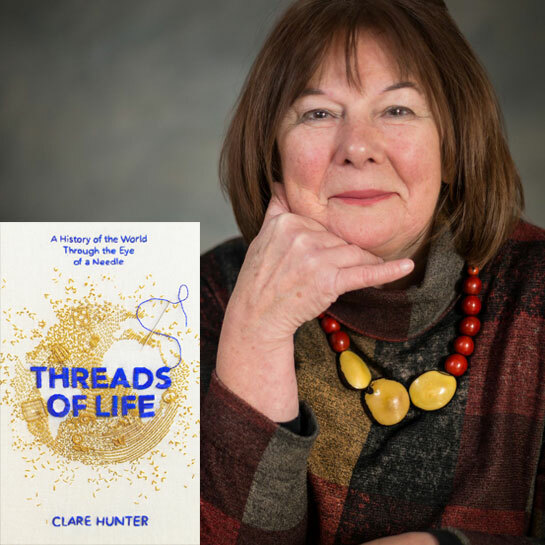 In Threads of Life, an eloquent blend of history and memoir, Clare Hunter takes us from the political propaganda of the Bayeux Tapestry to the maps sewn by schoolgirls in the New World and to a family attic in Scotland. It is the story of those who have used the language of sewing to make their voices heard, often in desperate times. Every Thursday the mothers of the disappeared in 1970s Argentina marched in front of government buildings wearing headscarves embroidered with the names of their lost children. In Tudor England Mary, Queen of Scots was under house arrest and her letters censored, so she sewed secret treason into her needlework to communicate with the world outside. The popularity of sewing, embroidery and ‘making things’ is surging. The link between sewing and improving mental health has been well documented. Clare has worked over many years with people who are the most vulnerable in society, using sewing as a way to help them tell of their lives and connect with the wider world.